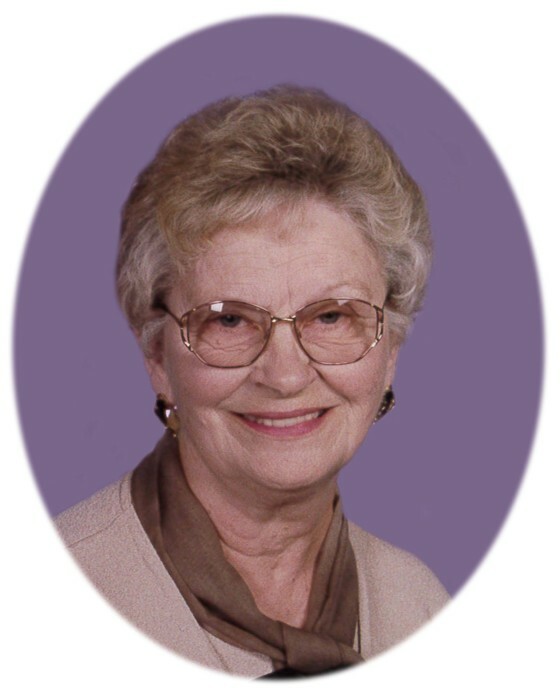 Doris L. Durnin, age 90, of Annandale died on January 20, 2019 at Good Samaritan Society in Howard Lake. Memorial Services will be held 11:00 a.m. Friday, January 25, 2019 at Dingmann Funeral Care Chapel in Annandale with Pastor Paul Baker officiating. Visitation will be held one hour prior to the service, Friday at the funeral home. Burial will be in St. Luke Catholic Cemetery, Clearwater. Doris Lorraine Durnin was born March 12, 1928 in St. Cloud to Oscar and Marcia (Barnes) Goldthorpe. She graduated from St. Cloud Tech High School with the Class of 1946. On December 31, 1949, Doris was united in marriage to Bernard Durnin at St. Augustine Catholic Church in St. Cloud; he preceded her in death in 2011. They moved to Annandale in October of 1959. Doris was a former member of the St. Cloud East Side VFW Auxiliary Post 4847. She was a homemaker that cared for her family and taught her children many life skills. Doris was a talented quilter, seamstress, painter, crafter and baker. She is survived by her children, Kathryn (Stephen) Roos of South Haven, Virginia Howard (Steve Jensen) of Annandale, Teresa Carlson of Annandale, Thomas (Dellie) Durnin of Annandale and Mary (Steven) Westerberg of Crystal; ten grandchildren, Jason Howard, Marc Howard, Jeremy (Amy) Carlson, Adam (Mindy) Carlson, Ryan Carlson, Anne Heinen, Stephanie (Luke) Lortie, Alison (Noah) Fieldseth, Amanda (Adam) Paumen and Todd Durnin; eleven great grandchildren, Ashleigh, Brook, Kylie, Connor, Dean, Stephen, Wyatt, Molly, Amelia, Jacob, and Addison; five great great grandchildren, Logan, Luke, Lexi, Cora, and Eddison; and sister, Helen LeClaire of Bemidji. Doris is preceded in death by her parents, Oscar and Marcia Goldthorpe; husband, Barney Durnin; great granddaughter, Jewely Anamarie Howard; brothers, Russ and Rufus Goldthorpe; and sisters, Clarene Schmidt, Mae Beard, and Ruth Kearin. A special thank you to the staffs of Heartland Hospice, The Lodge Assisted Living and Good Samaritan Society of Howard Lake. The urn bearers will be Alison Fieldseth, Amanda Paumen, Anne Heinen, Jason Howard and Jeremy Carlson. Arrangements are entrusted with Dingmann Funeral Care Burial & Cremation Services of Annandale.